OET offers comprehensive and specialized solutions for all milling operations. These solutions cover the whole process, from the delivery of raw materials through to the shipping of the finished products, with decision-making support and full traceability every step of the way..
► See the film "Moulin Dumée"
Handling incoming wheat and raw materials in bags, transferral to silos, decanting, checking and saving of weight readings from the weighing bridge, quality control and labelling. Cleaning and preparation of wheat, transferral, mixing, cleaning, steeping, checking and recording of quantities and management of rest times. 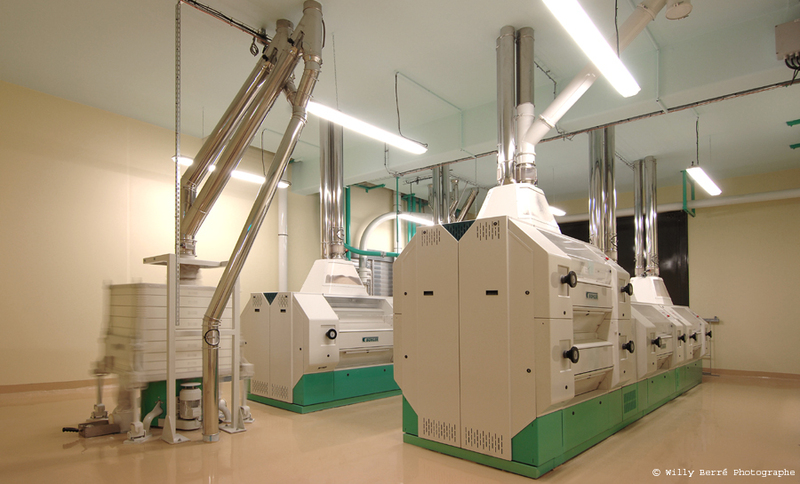 Secondary cleaning and milling: reception, silo transfer management and incorporation of micro-ingredients, recordings from weighing bridges, calculation and checking of yields, cylinder roll gap settings, grist management and shipping of flour and other products. Mixing flours with mix recipes, distribution between different containers, jetty management, monitoring manual procedures with barcode scanners, monitoring of dosage tolerance. Bagging with labelling table or automatic systems, management of bag stocks, SSCC labelling with inkjet printer, classification and consumables. Bulk shipping with automatic loading of flours, coordination with weighing bridges or loading scales. Bag shipping with checking of shipments using hand-held scanners or a scanner integrated with the truck loader, picking, product management and warehouse management. General operational matters: energy consumption, productivity and maintenance. ALIA System is a comprehensive, flexible modular solution with adaptable and upward-compatible functional capacities. It can be used to improve existing production processes by incorporating specialised modules for process management (ProcALIA), supervision (WinALIA) and sequencing (OrdALIA). It can also be used to optimise the performance of your commercial and logistical management processes, with the help of modules designed to assist with the management of raw materials (ComALIA), stores and warehouses (MagALIA) as well as delivery schedules (LogALIA). ALIA System can also make a valuable contribution to your ICT system. It can be used to improve your control dashboards (ALIAReport), securely manage your system remotely (ALIA Connect), and programme automatic back-up and archiving of data from your specialist software (ALIA Backup). Our experts have been conducting audits and analyses in France and internationally for over 40 years. They work hand-in-hand with your teams and partners to develop comprehensive solutions tailored to your activities. Our ALIA System is an upward-compatible solution backed up by the unrivalled expertise of our R&D Division. Drawing upon our expertise with robotic systems, we can help you with the ►palettization of your flour packs, with robots calibrated to handle different shapes, densities and pallet configurations. The goal is to boost your productivity, improve working conditions and optimise the quality of your pallets. IT: we integrate MES solutions to track and analyse the performance of your production systems, while guaranteeing the traceability of processes and materials. Weighing and metrology: via our subsidiary PGC, we design and produce measuring circuits and metrological control systems. These services include after-sale care and a maintenance contract.